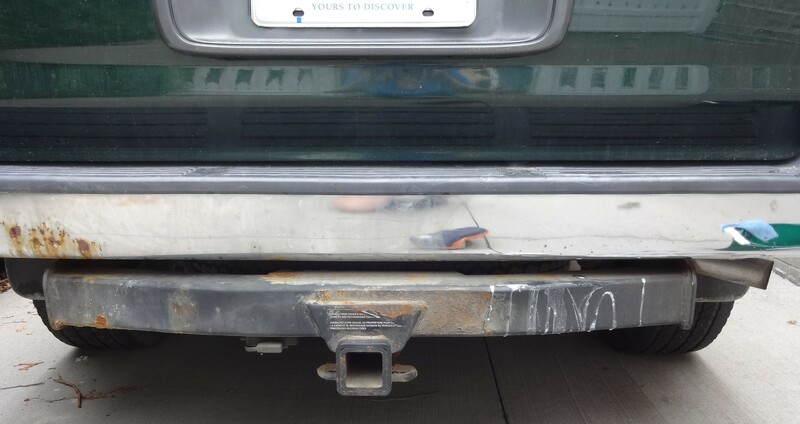 As a little test, I took my jar of Universal Stone out to meet our 14 year old Toyota 4-Runner today. I’m up in Canada, where they use salt on the roads in the winter, so rust… will… happen. I was mighty impressed with how quickly and easily the Universal Stone took rust off the chrome. Within 5-7 seconds – and with absolutely no elbow grease or pressure – the rust was almost completely removed! See? Gee, if you look closely, you’ll even see a warped view of me. Darn it! I’ve got to be more careful about that. I can’t be letting you know what I look like. Hee hee! The rust in most of the spots was so bad that the chrome had jagged holes in it and the sharp edges of the jags were pulling and tearing on the sponge. And I only have one sponge: so no way was I going to sacrifice it here. But… e-cloth Car Washing Sponge to the rescue. 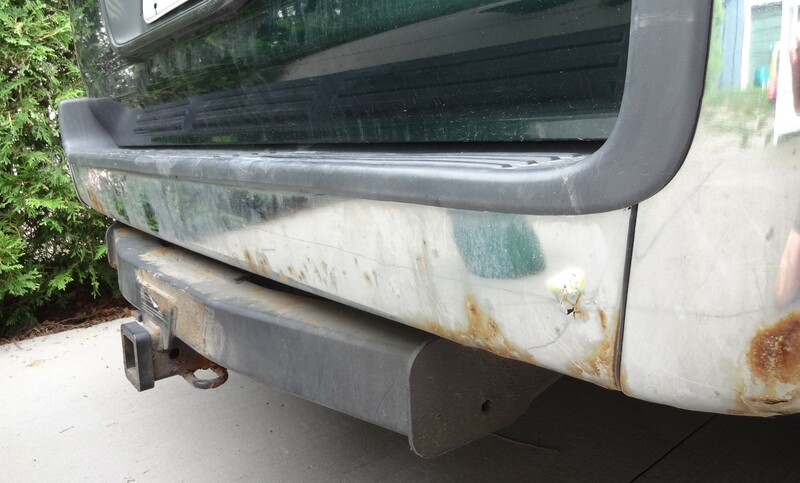 One side of the Car Washing Sponge has little, non-scratch scrubbers on it and it worked perfectly along with the Universal Stone to get rid of the rest of the rust. Take a look at this! Go ahead and click on those pictures. That’ll make them bigger and you’ll see how rust-free the bumper is. You’ll also see a clear line separating the areas that I cleaned and didn’t. Again, next to no elbow grease was needed. There is still a bit of rust on the bottom corner but that area was very delicate and I dared not put any pressure into the scrubbing for fear it would crumble. And here’s what it looked like afterwards. Obviously the scrubbers on the car washing sponge aren’t enough to remove rust on their own. This looks like a job for Universal Stone! For more information on Universal Stone and to see all the other things you can clean with it, visit eclothusa.com and/or check out my previous post on it. Nexte-cloth® BOGO Event – Are e-cloths the new underwear? e-cloth Bath Towel Review – Heavenly! Kate’s Law – If you take their diaper off, they WILL pee! Let me know if you could use some, Veen! Great on boats, kitchens, bathrooms, and outdoor furniture too. Just say the word and I’ll send some your way.